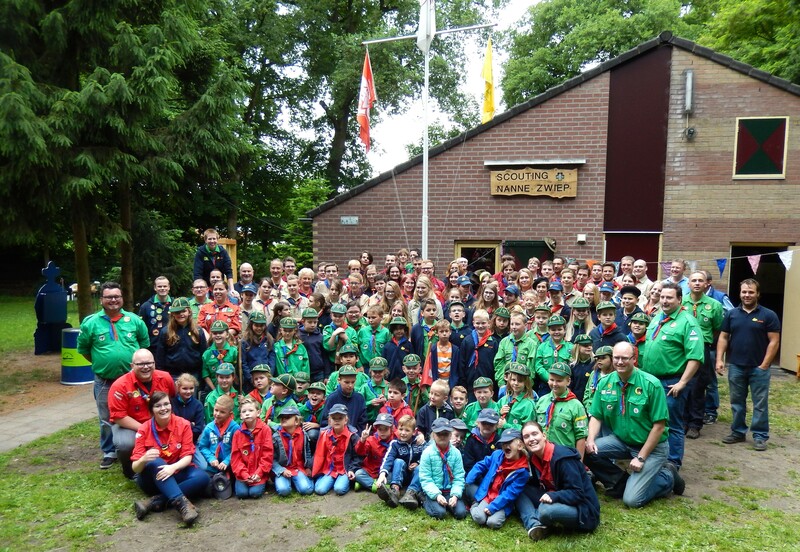 Welcome to the Nanne Zwiep Scout & Guide Group in Enschede, the Netherlands! On this page you will find translations of the parts of our website which we think visitors who don’t understand the Dutch language will most likely be interested in. Not all of our information has been translated to English or German, since the primary focus of this site is to provide information for our (future) members, everyone who is interested in our group or wants to rent our clubhouse. However, if you are interested in our group and you can’t find the information you are looking for on this page, please contact us. You’ll find our telephone number below. 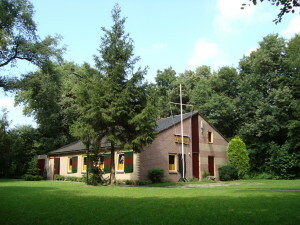 Every week more than a hundred fifty children and young people come to scout and guide with the ‘Scouting Nanne Zwiep’ group in Enschede. They come to our clubhouse to be active in a lot of different ways, to experience exciting adventures, to take on new challenges and to have a lot of fun together, again and again. About twentyfive enthusiastic volunteer leaders make it all possible. With the ‘Scouting Nanne Zwiep’ group you are welcome from the age of 4½. Regardless of whether you are a boy or a girl. Our whole group is not only a joint group, but a real mixed scout & guide group, an almost unique situation, even in the Netherlands! What Scouting takes into account is that a five-year old likes different activities than a sixteen-year old. Therefore, in Scouting we have different agegroups, called sections. There is always a section for you to do the things you like! See the list below. We all wear the scout uniform, practical clothing to play and scout in. Our group has a group scarf in the colours red (left-handside) and dark blue (right-handside). Every section wears its own colour shirt (Beavers red, Cubs green, Scouts beige, Explorers and Rovers orange). You can see examples on the sections pages. Our clubhouse is located in a nice woody area to the south of the city of Enschede, the biggest town in the east of the Netherlands, and only five kilometres from the German border. A magnificent location for nearly all Scout and Guide activities. Click here for the exact location in Google Maps. What do we do in Scouting? We provide a wide range of exciting activities, too many to list. Walking an exciting (night)hike, cooking our own meal, pioneering, campfire, sports and games, building a raft, climbing and abseiling, being creative, joining a primitive camp or an international jamboree, we do it all and a lot more! Look around on this site and you’ll be surprised what is possible in Scouting! You can get a tour with pictures of our clubhouse when you click here. For pictures of our group and activities click here. • Interested in joining? Try it yourself! If you are interested in experiencing Scouting yourself, come and visit our group! You are always welcome for a few weeks to look around without any obligation. Please e-mail us for further information or contact Marcel Dijkstra, phone +31 (0)53 4766 944. Please give your postal address and age. Rent our clubhouse – we look forward to your visit! Scout & guide groups can rent our clubhouse during (short and summer) holiday periods. It may be used for Scouting activities only! The facilities are equipped for about 25 – 30 persons. There are two rooms, normally one is used for meeting and the other for sleeping. A small third room can be used by the staff for sleeping or storage. There are no beds available, you have to bring your own sleeping bags. The new kitchen and leadersroom is equipped with a fridge/freezer and a gas cooker. There are two toilets with washing facilities (both two taps) and two hot showers. The building is centrally heated. We have our own campfire circle and a grassfield for games. The city of Enschede (158.400 inhabitants, eleventh city in the Netherlands) offers a lot of activities within a few kilometres from our clubhouse. Examples are indoor swimming and climbing, excellent shopping centres, an outdoor leisure centre with beaches and possibilities for swimming, dryskiing and waterskiing (at walking distance) and much more. The beautiful countryside around the town is mixed wooded and open grassland and is very good for (mountain)biking or walking. Enschede is just at the German border and about 150 km (= 93 miles) from the Dutch capital Amsterdam. The city is situated directly on the A1 motorway from Amsterdam to Berlin. 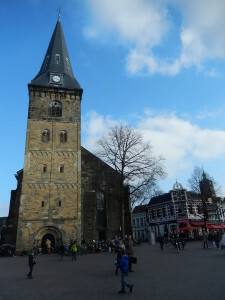 Enschede has direct train connections to Amsterdam-Schiphol Airport, The Hague, Utrecht and the German cities of Münster and Dortmund. For further information on renting our clubhouse, please e-mail us or contact Marcel Dijkstra, phone +31 (0)53 4766 944. Please give a postal address for us to reply to. Our group was founded May 1st, 1945, exactly one month after the liberation of Enschede on Easter Day, April 1st, 1945. The group was named after the Rev. Nanne Zwiep (1894-1942). He was a vicar of the Dutch Reformed Church in Enschede since 1929 and at the beginning of the Second World War a well-known man in our town. On Sunday April 19th, 1942, in a sermon, he spoke out against the National-Socialism and the persecution of the Jews. Next day already he was arrested by the German occupier and after five months of interrogation in prison in Arnhem and Amersfoort he was transported to the German concentration camp Dachau. There he deceased November 24th, 1942, after two months of exhaustion and malnutrition. Until 1982 our group was only a Scout group, with about 35 members in a Cub Scout Pack and a Scout Troop. In that year the first girls became member of the Cub Scout Pack. That was the start of the fully mixed group we are today. In September 1987 the group expanded with the Beaver Scout Colony and the Explorer Scout Unit. Only a few months later the building of our new clubhouse started. In June 1988 we moved to our new home, but only the outside walls and the roof were finished. It took one year and a lot of work to complete it. We used a lot of the materials of our old wooden house for this job. As a result of that the new clubhouse became our ‘home’ immediately! In August 1988 the Rover Scout Unit started, and in March 1991 the second Cub Scout Pack. Since 1996 our group is also owner of the home-ground. Today we have more than 150 members, staff included. Scouting was started by Lord Robert Baden Powell in the early years of the 20th century. Today, Scouting & Guiding have moved on greatly to become the world's largest youth organisation. Scouting & Guiding has spread right around the world. Scouts and guides are active in about 200 countries, with over 40 million members worldwide. Our group is member of the national Scout & Guide organisation of The Netherlands: ‘Scouting Nederland’. Scouting Nederland is member of the World Organization of the Scout Movement (WOSM) and the World Association of Girl Guides and Girl Scouts (WAGGGS) and organised two World Jamborees: the 5th in 1937 in Vogelenzang (near Haarlem) and the 18th in 1995 in Dronten, at the bottom of a former sea. For more information on Scouting Nederland visit their website (English pages). For the foreign visitors we want to give some further information about our country. Climate Northern maritime. Warm summers, mild winters. Health Excellent facilities. No unusual risks. No vaccinations required. Please send an e-mail for your comments and suggestions for the site! The common language of course is Dutch, but messages in English are also very welcome. If you have any ideas about which other information we should include on our website to help you, please let us know!